Finding space for a CD player on your small and fully occupied study table or cramped room could be a tall order especially when you are sharing with others. Yet life would be impossible without your music. To save you the dilemma, Muji has introduced a new wall-mounted CD player which you can attach to the wall or any flat surface. The stylish and user friendly player works in a pretty simple way. Once users have loaded a CD into it, they just need to pull on to the string at the bottom of the CD player. The CD will start playing and the sound will be transmitted via the built-in speakers in this player. To stop the player, users just need to pull the string again. It works like those old fashion oscillated wall mounted fans. A pull to the string makes the device works while another pull to the string stops it. Users can control the volume and do playlist search via the control button located on top of the device. 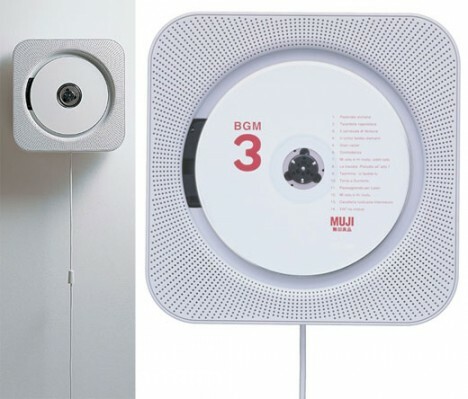 Weighing 1.2 lbs and measuring about 6.9 x 1.6 x 6.9″, the Muji wall-mounted CD player looks quite trendy and unique. However, the price of $178 could be a bit expensive compared to conventional CD players equipped with superb sound system. Users who like the concept can get it from Muji retail or via the Muji online site.